I have these speakers setup with an Arcam rDAC via USB and then connected to my Onkyo Integra DTR 7.7 receiver. They sound awesome. I previously had bought some B&W 686's and I actually really loved those speakers as well, but the price was way to high and I was able to score these on CL for about $80. So I did a thorough comparison over the course of a week. I thought actually that these sounded a little better so I returned the other speakers. I have been super happy with them. They are a little bright for my ear but I toned them down a bit with the settings on my receiver. If you can find these for the right price I would highly recommend them. The low end in thee speakers in incomparable. I have a sub, too, but these speakers could carry most of the bass load themselves if you don't want to spring for it, in theory, ou could skimp a bit on the sub and let the speakers keep up. They are loud, handle nuance well and have the best range of sound for the price. Much cheaper and preferable to Bose. they are so heavey you'd never want to hang them on the walls. Get shelves. None, so long as the speakers a properly placed in the listening area. This is very important. Very solid construction. These bad boys are heavy. The bass response really surprised me. While not a subwoofer, perfectly fine for music listening. More than I expected. The highs are clear and crisp. 5 way binding posts allow for banana plug use. Excellent soundstage. Warm rich sound with real wood cabinets. Great for both music and HT. Excellent soundstage. Exceptional build quality. Great for both music and home theater. Originally, I was one of the millions impressed by Bose acoustimass systems. However, 2500 was a bit too much for me. So I set out to buy a reasonably priced HT system which could at least match the LS28. I opted for Polk RTi38 for fronts CSi3 for center and RM2350 for surround. Coupled with Onkyo SR701 and Velodyne Sub this system far outperforms the Bose LS28 at a little over half the price. I had planned to upgrade the fronts to polk LSi7's in case RTi38's were not satisfactory. Needless to say, they are more than adequate as fronts. For some reason I am not so impressed with their recent replacement the RTi6. May be because of its obtuse shape (9" wide and 15" deep! ), but my prediction is that the RTi6 will not sell as much as the 38s. highly listenable, smooth with above average detail. qualty of build is amazing for the price. 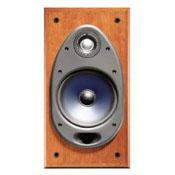 none, any tradeoff made in this speaker only lends them to long term listenability. these speakers are extermely listenable. some say overpriced, i can tell you they out perform most speakers under a grand. finish, and build quality are first rate. a good friend of mine owns b&w 805 nautilus. at 1500 the pair, they have a slightly better soundstage, and are more refined sounding. but for extended listening, the polks are better. my friend agrees. there has to be trade offs. matt polk must be a real music lover, because most of the speakers polk has made over the years, offer just that. long term listenability. and i know of no other company that offers this buid quality for the price. these are by far the most inexpensive speakers that have an acoustically dead enclosure. in listening to infinity, klipsch, and paradigm, i've always heard some cabinet resonance at these price points. matt polk continues now more than ever to offer the finest stuff available at a given price point. some other speaker may jump on your ears at first, but in the long run these win. by the way, i see often people mention the word audiophile. being an audiophile is a state of mind, and not the equipment you can afford. many affluent friends have asked for my advice over the years. when i ask them why, i'm told that if i can put together excellent sound on my budget, i can surely do it on a cost is no object basis. i love music, and am very thankful for this site, please purchase your speakers from a vendor that allows a 30 day listening window. because an hour or two at the store gives you no idea if the speakers are right for you. paradigm monitors, infinity interlude, klipsch sb3, klipsch is ok, but wears on your ears in time at loud levels. Very well made speaker. Real wood veneer. Sound is absolutely unbelievable. Mids are clear and highs are perfect. The bass response, while not a subwoofer, is still quite impressive. Highly recommended. I purchased these demo speakers on clearance because the price was so good. I had been shopping for speakers for over a year and simply couldn't make a decision since none of the speakers I heard seemed to stand out from the pack. Speakers auditioned included B&W DM601S3 and DM602S3, PSB Image 2B and Stratus Mini, KEF Q1, Polk Lsi9 and Lsi7, Energy C3, Meadowlark Swallow, Acoustic Energy Evo One and Evo Three, and Vandersteen 1C. The Rti38 were difficult to judge at the dealer which is why price was the final factor in the purchase. That being said, I couldn't be more pleased. I am using these speakers in a stereo only system which also includes a Harmon Kardon HK3375 receiver (excellent) and a Denon DCM-380 cd player (good but not great)with Kimber Kable interconnects and speaker cable. Although I feel these speakers excel in all areas, the best thing about them is their balanced and full presentation. The highs, mids, and lows are detailed and in proper proportion. Soundstaging and imaging are very good. I was very pleasantly surprised at how much better the Rti38's sounded at home over the showroom. My listening room is small but I am impressed by how well the sound is throughout my apartment. The bass is particularly outstanding on these speakers. It is full,rich and large sounding without being boomy or inaccurate. The last thing to mention is Polk customer service. When I set the speakers up at home I discovered a small problem with one tweeter. Polk supplied a replacement part at no charge even though the sound was not affected. I thought this was really impressive especially since these are a demo, clearance purchase. These are great speakers. They are as good as speakers costing hundreds more. The soudstage is incredible. It sounds like Celine Dion is singing right in my living room. Actually, when I first got the speakers I actually got up to make sure the center channel speaker wasn't on because. The build quality is obviously very high. They sound great with all kinds of music. And of course they're wonderful for home theater. Excellent build quality, beautiful finish. Clean upper and mid frequency reproduction. Adequate bass (on stands), if used with a sub. Imaging is excellent. They don't sound as good as speakers that cost 10x as much. Duoh! DCM timeframes (old towers). Various models auditioned in-store. Heavy. Great Mid/ Bass. Warranty/ Customer Service is excellent(5 Years). Highs could be a bit more defined. The Polk LSi series addresses this issue. I purchased these from Crutchfield, yes they are/were overpriced, but I am still happy with my purchase. Set-up is: RTi38(Main), CSi30(Center), PSW202(Subx2), Sony STR-DA2ES. Room dimensions are 12x17, concrete floor, carperted, heavy pad. I am a Polk Audio fan, so buying them was a solid purchase for me. Build quality is excellent, very heavy, which I prefer. Highs are very nice, Boston Acoustics has a small edge in clarity. KEF/ Paradigm are also excellent high end performers. Mids/Bass is excellent. The bass is tight, and punchy. I believe my room eats a little of my bass, to include the Subwoofer. I have the RTi38's mounted on the wall with B-Tech brackets, and connections are hardwired into walls via Monster Cable. I moved them there to help the with the resonance and sound from being absorbed/amplified so much by my entertainment center. It did improve imaging, and bass cleared up a small amount. I really am enjoying these speakers. None. I have listened to many different speakers. I chose Polk Audio due to prior experience, and value.